I have two daughters, and one of our favorite things to mix up each day is a green smoothie. I LOVE knowing that they are getting a big dose of super healthy foods! They love helping me figure out what to put in our smoothies, and I make sure I teach them about those healthy ingredients as well! I love the added punch of the powdered superfoods (spirulina and chlorella). Through trial and error, I have figured out how much powder I am able to add to each smoothies (we make a full container, enough for 4 big classes of smoothie!). I am able to generally get away with adding around 1+ TBSP for the four of us. 2 TBSP and beyond is too much, considering they are both types of algae! Spirulina and Chlorella are both powerfoods, full of digestible protein, lots of vitamins and nutrients, and antioxidants. You can be assured that the Spirulina and Chlorella offered by The Natural Health Advocates are super pure and wholesome. We do not typically make our smoothies very thick. 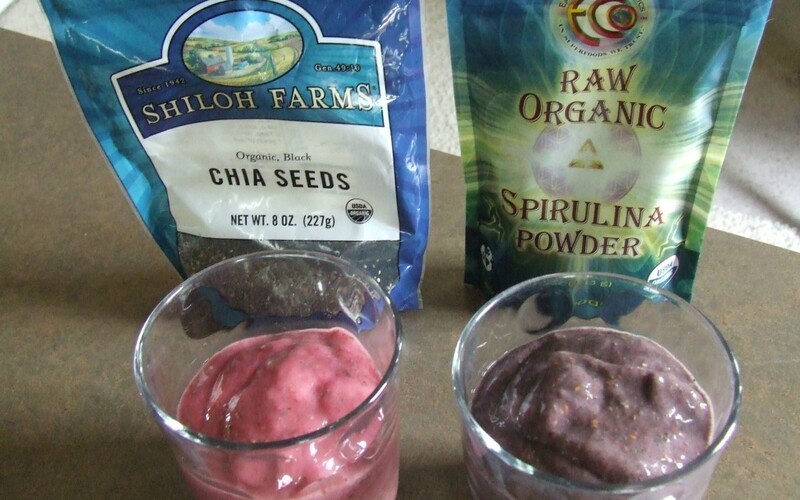 If you like thick smoothies, one awesome addition would be chia seeds! I am really able to pack in the veggies. The amount of greens that my girls get in each smoothie is the equivalent to a large salad for an adult. We throw in raw carrots as well, the Vitamix pulverizes them so that you don’t realize whether they are in there or not! We love to add our fruit in frozen. I buy more bananas then we regularly eat, and will peel them and break them in half and add them to the freezer. My magic fruit, though, is the frozen mango. Mango has been a smoothie constant ever since we first tried it. It adds so much flavor and even seems to make it a little creamier! One time, I found a great deal at a discount grocery store for giant containers of organic baby spinach and organic baby kale, so I bought all I could, stuffed the leaves into gallon plastic bags, and put them in the freezer!!! When I used the frozen greens plus frozen fruit, plus a little bit of liquid, it made SMOOTHIE ICE CREAM!!!!! Our smoothies were so frozen and thick, that we could eat them with spoons, and my girls thought this was the greatest thing ever!